Lighting can bring a whole new dimension to bowling. Some patrons prefer traditional illumination methods while others, particularly the younger generation and families, are always eager to try something new. Even bowling centers that decide to stick with the tried and true are updating their lighting systems these days for the sake of energy efficiency. 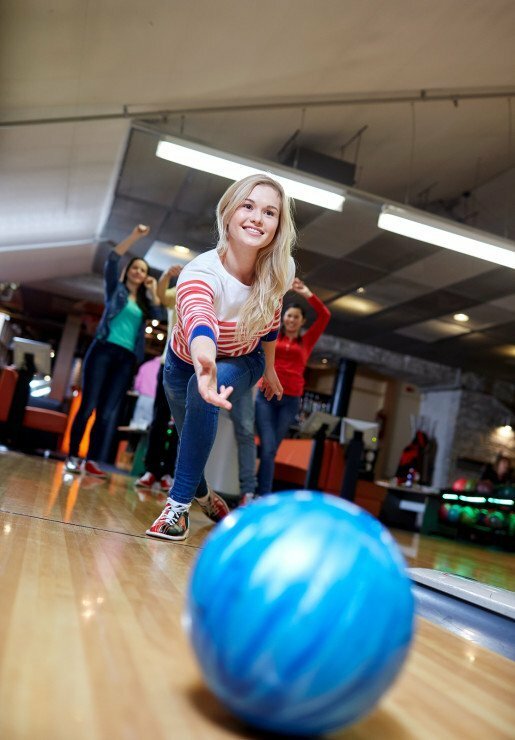 Five bowling centers around the country weighed in on what works for them. Keeping different bowling subsets happy can be a bit of a juggling act, but AMF Davie Lanes solves the problem by catering to Extreme Bowlers on the weekends and to more traditional league bowlers during the week. The only change the traditionalists have been subjected to in recent years is an upgrade to LED lighting, which of course has enhanced illumination all around, and resulted in significant energy savings for the business. Bowl-A-Vard Lanes in Madison, Wis., doesn’t have a black lighting system. Open and league bowling rule the roost at this 40-lane facility that has been a bowling tradition in the community since 1950. Convention aside, Bowl-A-Vard has recently began making some changes to its lighting operations. “We just started turning certain sections of the place over to LED lighting,” said Manager Mike Gannon, “because it was getting to the point where you just can’t get 8 foot fluorescent bulbs anymore so you have to change.” This Madison mainstay incorporates a banquet hall and two large bars. “It’s a pretty big place so we’re doing it in sections. That way the cost isn’t as huge as when you switch everything over at once,” added Gannon. Regular patrons seem to be appreciating the upgrade. Several have commented on how the LEDs have made everything brighter. Freedom Lanes in Duncan, Okla., debuted its black lighting system on New Year’s Eve 2012. “It was a real big hit,” said Jean Brund, owner of the 24-lane facility. Three years later, the novelty still hasn’t worn off and black lighting remains a crowd-pleaser. “We call it Neon Nights and feature it on Friday and Saturday nights and for birthday parties. It definitely increases attendance.” Meanwhile, Brund has her eye on a Lightworx system by Brunswick Bowling and Billiards Corporation. She eventually plans to install the colorful computer controlled light show that illuminates the pins and pin decks and features a musical interface. It really makes a big difference, according to Brund. The system is expensive though, with the cost averaging $1,000 per lane. “But I guarantee you if I could get it in, it would probably pay for itself in as many weeks,” she concluded. Cosmic bowling, aka Cyber-Bowling, packs them in at Bedroxx Bowling in Tucson, Ariz., on a regular basis. For at least four years now, the 30-lane facility has had a black light on every lane, multiple disco balls, fog machines, lasers, strobes. It’s a work in progress. “Our lanes light up, the bumpers light up. We have quite a bit of special lighting. This being a family entertainment center, it really benefits us because it brings in a younger crowd, families, groups, parties. We probably do about 20 corporate parties a month and a lot of them like the cosmic bowling,” said Manager Ashley Johnson, who also serves as the center’s event coordinator. Eventually Bedroxx would like to add illuminated pins to the mix. “Our customers would definitely enjoy seeing the bowling pins light up and turn multiple colors like purple, yellow, blue, green,” she added. Bowling has certainly come a long way. The ever-changing nature of lighting practices seems to indicate more innovations lie ahead. While some facilities are content making only minor upgrades, still others forge ahead, drawn by the light. Ultimately, it boils down to knowing your customer base.